This is a take on the northern Italian dish, osso bucco with risotto milanese, but using lamb instead of veal shanks and lemon instead of saffron risotto. In a frying pan, heat the oil and brown the lamb shanks on all sides, in batches if necessary. Transfer to a casserole. Add the onions and garlic to the frying pan and cook on a low heat for 5–10 minutes until soft. Add the herbs and cook for 5 minutes more; transfer to the casserole. Add the wine to the frying pan; bring to the boil, scraping up any bits, then add to the casserole. For the risotto, melt 40g butter in a heavy pan; add the onion and cook over a low heat until soft. Meanwhile, in another pan, bring the stock to a simmer. Add the rice to the onion and cook for 2–3 minutes, then add the wine and turn the heat up to medium. When the wine is absorbed, add 1–2 ladles stock at a time, adding more as each ladleful is absorbed. After 20 minutes, test the risotto – it should be creamy and slightly al dente. In a bowl, stir 30g parmesan into the lemon juice. Once the risotto is cooked, add this lemon juice mix, the zest and 20g butter; season. Cover, turn off the heat. After a short rest give it a final stir. 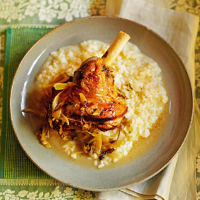 Ladle a serving of risotto onto a plate; rest the lamb on top, spooning over some of its juices. Serve with the remaining parmesan for sprinkling over the risotto.